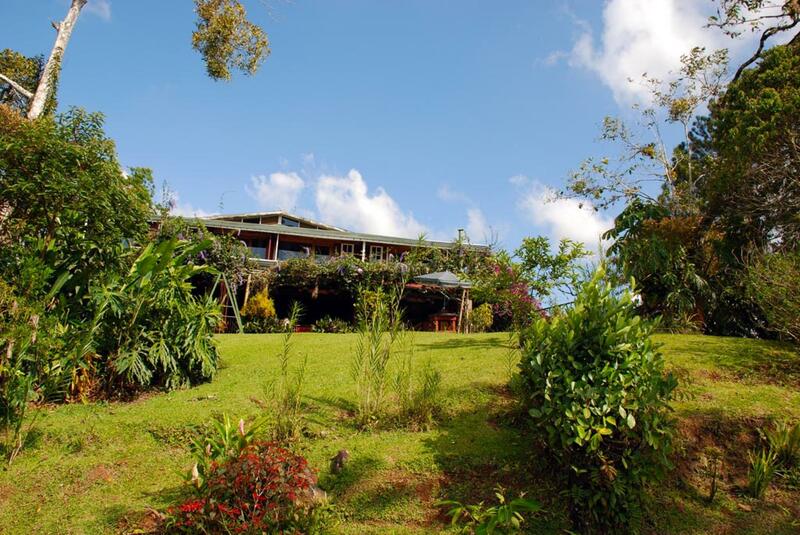 The splendid Turrialtico Mountain Lodge is located in the central highlands of Costa Rica, just outside of the town of Turrialba. The charming town of Turrialba is conveniently located between San Jose and the Caribbean Coast, surrounded by fertile farmland and green mountain pastures. The world renowned Pacuare River attracts many white-water rafters and kayakers. This charming town is also famous for its cheese, production of hand-sewn baseballs that are used in Major League Baseball and for open-air fruit and vegetable markets that have some of the freshest, best-looking produce in Costa Rica. Besides the area there is a outstanding river rafting and kayaking, Turrialba also lends itself to horseback riding tours, canyoning adventures and mountain biking. On the slopes of the Turrialba Volcano lies Guayabo National Monument, one of the most significant pre-Colombian archaeological ruins. Visitors who like birding and hiking can venture into the surrounding jungle areas or hike the trail to the top of the Turrialba Volcano. The lodge, surrounded by beautiful tropical gardens and gorgeous scenery, offers guests the chance to explore the area on one of the many trails surrounding the hotel. As you walk the grounds, visit the orchid nursery, where you'll see eighty different species of this stunning flower. Strategically located on a hill above the valley and overlooking the town of Turrialba, is the hotel&s open-air restaurant, offering incredible views alongside delicious and innovative Costa Rican meals. Turrialtico Mountain Lodge's simple and charming rooms were constructed with wood, giving them a rustic feel, but with the modern conveniences of a private bathroom and warm water. The eighteen rooms are colorfully decorated with locally made bedspreads and artwork. The balcony showcases the incredible views of the landscape, the Valley of Turrialba, majestic Turrialba Volcano and the Talamanca Mountain Range. "Most memorable was Turrialtico Mountain Lodge and archeological park tour (probably because it was our first stop)--so romantic, and we loved the family-owned atmosphere, food, hummingbirds, and the family dogs guiding us to the waterfall, and the quiet peacefulness overlooking Turrialba at night with the volcano behind (didn't know it had erupted the month before!! !--now that would have been exciting). They arranged a tour to Guayabo Park for us as well as horseback riding the next morning at the farm next door. Our guide at the park gave us such an impressive history lesson. The friendliness of the hotel staff and surrounding garden and waterfall made s significant first impression. " Most memorable was Turrialtico Mountain Lodge and archeological park tour (probably because it was our first stop)--so romantic, and we loved the family-owned atmosphere, food, hummingbirds, and the family dogs guiding us to the waterfall, and the quiet peacefulness overlooking Turrialba at night with the volcano behind (didn't know it had erupted the month before!! !--now that would have been exciting). They arranged a tour to Guayabo Park for us as well as horseback riding the next morning at the farm next door. Our guide at the park gave us such an impressive history lesson. The friendliness of the hotel staff and surrounding garden and waterfall made s significant first impression. Beautiful location. Clean rooms. Friendly staff. Fabulous food.